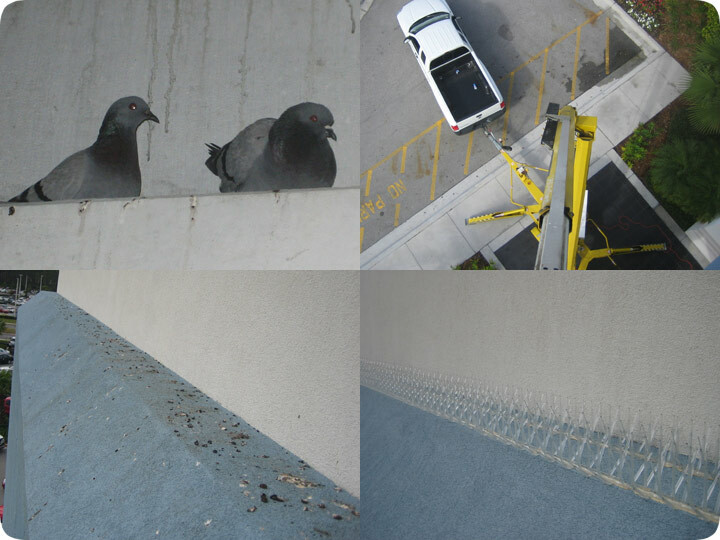 01.20.2006 - An Orlando area car dealership called me with a common urban problem: pigeons. The pigeons were roosting in several areas of the dealership, most notably on the raftors in the parking garage and on the concrete wall above the showroom doors. The problem with pigeons is that they eat, which often means that they eventually poop. Pigeon poo is a problem. It's not just unsightly, it's caustic, and corrosive. This means that the pigeon droppings that fell on the cars in the parking facility actually damaged the paint jobs of these new autos. A manager at the dealership told me that several of the cars required multi-thousand dollar paint jobs as a result of the droppings. As for the unsightliness, it did little to bolster the image of the otherwise squeaky-clean dealership. Furthermore, three diseases that humans can contract are known to be associated with pigeon droppings: The first is histoplasmosis, a fungal infection of the lungs, and also cryptococcosis, and psittacosis, which are more rare, and also fungal infections. Regardless, the potential liability in a public setting is too great. The pigeons had to go. Pigeon control is typically handled in one of three ways, or a combination. First of all, the pigeons can be trapped and removed. Second, they can be removed by lethal means (shot). Third, their habitat can be altered. It's generally not terribly effective to trap pigeons. Sure, it can be done, and there are several effective pigeon traps out there. The primary problem is that they can't really be relocated. Pigeons have a neat habit of homing in on their original territory. Over say, thousands of miles. Thus, the only effective method of pigeon trapping and removal relies on killing the birds. As is often the case, trapping in a situation like this is futile. You'll never get all the birds, and if the environment is suitable, more birds will come take the place of those you've removed. I suppose, with very high quality trapping and a lot of dedication that the population can be sufficiently abated, but it just seems like a silly approach. ...the third method, which is habitat modification. The pigeons are roosting in the area because the area meets their needs. Basically, if you take away their roosting areas, they can't live there, and will leave. This usually means installing physical deterrents on the perching spots. So for example, if the pigeons are all hanging out on a ledge, cover the ledge with sharp spikes that they cannot land and perch on. Bird repellent and deterrent products include spikes, shock tracks, slippery sloped surfaces, and even sticky glue. I photographed the above series of photos while on this particular job at the Orlando car dealership. In the upper left is a nesting pair of pigeons roosting in the raftors of the parking garage. The pigeons in the garage were the ones responsible for the damaged paint jobs. In the lower right, we see the outside ledge over the showroom doors, on which many pigeons perched and pooped. In the upper right, we see the view from the boom lift that I rented for this job, in order to reach the tall roosting areas. In the lower right, we see that I've cleaned the ledge and installed two rows of needle strips to prevent any pigeons from ever landing there again. I also installed deterrents in the parking garage to take care of the problem there. Pigeon work isn't glamorous or much fun, but it has to be done.